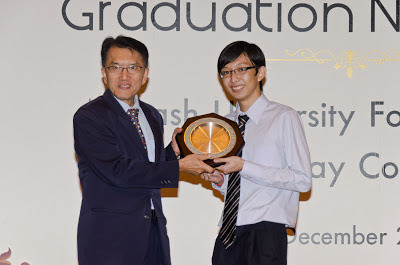 At the graduation night in December last year, eight students of Sunway College Kuala Lumpur’s Monash University Foundation Year (MUFY) achieved the highest score among all providers of MUFY worldwide in subjects covering Accounting, Advanced Mathematics, Biology, Economics, Fundamental Mathematics, Mathematics and Physics. They received a total of ten awards from Monash College, Australia.The recipients were Ashwinee Rvan Ravindran, Ooi Ken Ric, Tee Hsin Yee, Gavin Ong Jon Chen, Vederalage Mohaned Ishrath Ali Badurdeen, Chan Shang En, Elaine Yong Yun Ling and Hong Chin Choong. Two of them, Ooi Ken Ric and Tee Hsin Yee gleaned two subject awards each. These were based on the November 2012 examinations. Ooi Ken Ric had the highest overall score among the cohort. The cohort of graduating students also achieved an average pass rate of 94% across all subjects with 55% of them scoring either a high distinction or a distinction. Three students among the graduates qualified for Monash University Entrance Scholarships. They were Ooi Ken Ric, Crystal Chow Yern Nee and Tee Hsin Yee. MUFY providers are located in Indonesia, Sri Lanka and in Malaysia, at Sunway College Johor Baru and Sunway College Kuala Lumpur and of course in Melbourne, Australia. Sunway College KL and Sunway College, JB are the exclusive providers of MUFY in Malaysia. There are currently close to 800 students enrolled in Sunway College Kuala Lumpur. MUFY pre-university programme qualification is recognised for entry into universities in Australia, New Zealand, United Kingdom and the United States of America. mơ thấy người yêu cũ nghĩa là gì và đánh số mấy.